Major Peter Brian Jelbert 1945 – 2005. Brian was born in Camborne in Cornwall in October 1944. I was nearly two then and later we would have a sister, Susan. 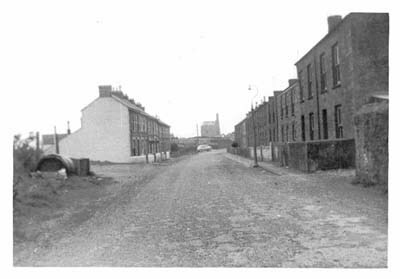 Brian and I began life at number 23 Redbrooke Road in the end-terrace house on the left of this picture. On more than one occasion he brought his wife and family back to this sreet, as well as other places he remembered from his childhood; Enys Road and Wellington Road for example. He was a proud Cornishman all his life and like so many other Cornishmen, often entertained thoughts of one day returning to the county. After completeing his ‘A’ levels at the Humphrey Davy School, Penzance, Brian moved away to begin his military career. From an early time Brian had wanted to join the Services and in 1965 he successfully applied to enlist in the Army and went to the RMA, Sandhurst. However, while initially commissioned into the Royal Military Police, he quickly arranged to undertake the Army's five year long finance course, with a view to then transferring to the Royal Army Pay Corps to become an Army paymaster and he subsequently spent the majority of his twenty years military service happily undertaking the financial management and audit of military units while at the same time gaining further accountancy qualifications. Brian served in Germany, Northern Ireland and Gibraltar amongst other places. In 1968 Brian met and married Karol (Spendlow), herself an `Army' daughter and their thirty-seven years of married life proved to be exceptionally happy ones. Denzil and Vanessa were born in 1973 and 1976 respectively. Karol developed arthritis at quite an early age and Brian’s dedication in supporting her, particularly when at times Karol was wheel chair bound, was a credit to him. Brian left the Army in 1986 having reached the rank of Major and soon after he accepted the position of Bursar at St Peter’s School, York. The School was undergoing a deal of change and the challenge for the new Bursar was to overhaul and simplify the school's financial and budgetary processes, something which Brian achieved with consummate success. Brian ran the school's Combined Cadet Force for some years, an involvement which allowed him to draw upon his experience as a soldier and which gave him enormous pleasure. He was himself a very good rifle shot and through the Corps and its activities helped generations of boys to see a view of the world beyond school life. It was a sad day for St Peter’s when he handed over command of the school contingent. Brian had only just retired when his illness developed. It was all very sudden and left all of us quite shattered. It was only six months from first diagnosos to his death in June 2005. During that time he did everything possible to make arrangements to smooth his passing, until his strength failed him. He died quietly in St Leonard’s Hospice just a few days after being admitted. Karol had heroically looked after him for all but the last few days when she had to admit defeat. Brian’s funeral service was completely arranged by a saddened but grateful St Peter’s School. A eulogy read by a member of staff at the service contained much praise for all of the very signicant achievements he made there. This is the concluding paragraph. “ High standards, loyalty to family and colleagues, a strong sense of right and wrong, a determination to complete any task to the best of his ability, a sense of humour that when it glowed lit up his personality and the ability to accept the decisions of others were the hallmarks of this man. He loved his time at St Peter's as he had loved his time in the Army. He gave so much to those with whom he served and in return they will honour his memory for his achievements as a thoroughly professional and dedicated servant of this great school. We shall mourn with his family who have lost someone who was very special but equally we shall dance in celebration of all that he achieved in his sixty years on this earth. The speaker also recalled Brian’s sense of humour. Although motor cycling was one of his great interests, the hobby to which he devothed most time and effort was his interest in genealogy. Brian always visited Cornwall during his holidays and, about thirty years ago, began his research into the ancestory of Jelbert and Gribble family trees. He would take his long suffering family on trips to churchyards in Morvah, Zennor and other wild places (!) to study gravestones and parish records wherever he could. He soon began to make contact with other Jelberts, Jilberts and Jelbarts from all over the world. This led to the founding of the Jelbert Society in 1993. The story of the Jelbert Society is told HERE. Brian is survived by his Wife Karol, their son son and daughter Denzil and Vanessa, his brother and sister, Roger and Susan and our Mum Victoria. All of us miss him greatly and he is often in out thoughts..